Wayne Cox, of Buckmasters Trophy Records, holds the potential state record antlers entered by David Kent, Topeka, in the Monster Buck Classic Jan. 27-29 in Topeka. If proven to be poached, the buck would not be recognized as a state record. TOPEKA—The 14-point whitetail buck that topped entries at the Monster Buck Classic Jan. 27-29 at Kansas ExpoCenter, Topeka, may have the caveat of being illegally harvested. Allegations of the poaching were brought to Kansas Department of Wildlife, Parks and Tourism (KDWPT) law enforcement officials, and after investigation, David V. Kent, Topeka, was charged with poaching the deer. 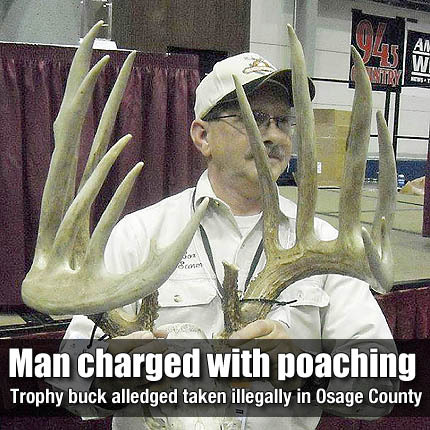 The Wichita Eagle reported KDWPT agents compared the antlers to a game camera photo of a live buck taken in Osage County, and that the antlers were believed to have came from the same deer. The Eagle also reported Kent confessed to law enforcement. Osage County Attorney Brandon Jones filed eight charges in Osage County District Court, including criminal discharge of a firearm, criminal hunting, illegally hunting with an artificial light, hunting outside of legal hours, illegal hunting during a closed season, using an illegal caliber for taking big game, illegal hunting from a vehicle, and hunting without a valid deer permit. The eight misdemeanors carry a combined maximum fine of $7,000 and sentence of 18 months in jail, and the potential revoking of Kent’s hunting license.